This level has easy difficulty. For this level try to play from any part of the board where more candies available to play to make special candy. 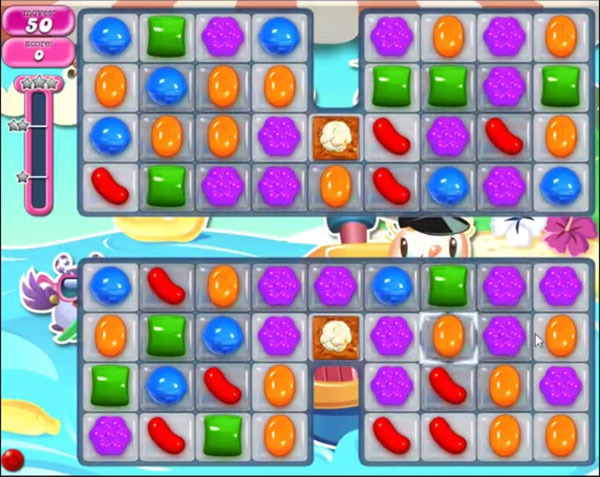 Combine special candies with each other to break the jellies or play with remaining jelly candy to break them all to reach the target. No one play this game anymore, so why should i? Can somebody tell me why i get the treasure while i can not get the level, boring. I catch pokomons now. Much fun?? What a good idea, i play pokomon now, better than the boring levels of CC . They are going down under. This is the end of the king games.? I stuck on this level for several weeks. I already stop this game, like everyone. Everyone stop this game, dah, only CC does not understand, haha. How arrogant can you be? For me Bey Bey with this fu**ing game. Wake up brothers and sisters, end this game like sooo Many others an start to plat other, not king size, games, because they are sh** games. Hello CC, why should i be interesting in the treasure, i don’t play this boring, irritating level anymore. I play pokomon now, thats a good game? I also stopped playing this game for a long time but CC is still sleeping . I don’t know anyone who play this game. They can better stop with iT. I also play pokomon now. More fun in a long time. Cant understand wy people still play this game. I also stop at 1170 no fun at all. Irritating! People, wake up! CC is a sh** game! After several moves you know you never get this level, so what is the fun to play this game? I stuck on for to long and startend playing other, not king games, so boring the CC games?? This whole game is a disaster, sorry CC for me game over. This game ends for me here. And… I have another game, more fun and i already catch a honderd pokomons??? I also stop playing this game, so boring, irritating and no fun at all, i even end the game before iTS finished. The end of Candy crush saga i think no one play this game anymore, i think CC is fed up as well, like me.? My tablet sas in relais. Nog snel i have of back i stil stick in thos shot annoying leven. Bey Bey cc top man People struckel in thos game. I tuin that King games Will loze players wit theorie games. Cc saga wasmachine te only game i players, bit nog tuis game su** as alle thema’s otters, i Amsterdam rond without thema King games. I read all these negative comments before I play the level. I then play and get it on one or two rounds. I can’t see what you people complain about if your on level 1170 . Terrible level. Played many times, no luck.